Dawn Lee submitted the following. My daughter, Meagan Lee is marching as a lead baritone player during the 2007 season with the Blue Stars. She marched as a rookie with Capital Regiment in 2006 and the 2005 season with Frontier, a DCA corps in the Dallas, Texas area. She is a graduating senior and a four-year member of the Texas State 5A UIL Marching Champion Marcus High School Band. Almost 19 years ago, on a Friday afternoon, I heard the words, "It's a girl." I immediately had thoughts of ribbons, dress-up tea parties and ballet lessons. I never really thought about tan lines, marching shoes and standing in the tunnel at the RCA Dome in Indianapolis, but that's where we ended up. My Meg is a devoted, hard-core, second-year marching member of a DCI Division I drum corps and her dreams of green turf and vibrant silks overshadowed my visions of pink satin and tulle. I couldn't be more thrilled. It's not easy sending your child off for the summer. I miss her while she's gone. I worry, and other parents think it's weird. They ask what her summer plans are and I tell them. Then this puzzled look crosses their faces and they ask things like, "Is it like that movie, 'Drumline'?" The more knowledgeable ask, "Is it that thing on PBS (and now ESPN2)?" I have a pat explanation down by now. It goes something like this: "Well, you audition with hundreds of other kids and they pick up to 135 for each corps. You travel one weekend a month from November until late spring to rehearse and then when school is out, they move into a campus, sleep on gym floors, practice and spend three weeks marching, rehearsing about 16 hours a day. "After that, they all get on buses and spend 80 days traveling around the United States, living on the bus and sleeping on gym floors and driving all night from show site to show site, performing in competitions about five times a week. "It all culminates in the DCI World Championships in August. It's amazing to watch. They are the cream of the crop of young musicians. Oh, and you pay up to a few thousand dollars for the privilege." Most stare. Some ask, "Why would anyone want to do that?" And I frequently hear, "How can you let her go away all summer? She's so young." So why do I let her march? It started in middle school when Meg sat down with a band director and flashed them her mouth full of metal and the director said, "euphonium." Euphonium? No way! She's a girl, for goodness sake. I remember going home and telling my husband, "Why not the flute, or clarinet or something more feminine?" But we tried it. Isn't middle school the breeding ground for trying things? Meg and that euphonium fell in love and by the end of her first year in middle school, she was well on the way to becoming the penultimate band geek. As she entered high school, she became a "Bando." (For those of you not in the know, and without the wisdom of a resident 18-year-old that's a "Band Obsessed Teen" who doesn't march in a drum corps.) She started downloading historic shows from the Internet and prattling on ad nauseum about Santa Clara Vanguard's 1989 "Phantom of the Opera" and Phantom Regiment's 1996 "A Defiant Heart" and Madison Scouts' "A Drum Corps Fan's Dream, Part Dos." When the Santa Clara Vanguard "Scheherazade" poster went over the Leonardo DiCaprio poster in her room, there was no use denying it any longer. I had a drum corps freak on my hands. She was in love. I held off as long as I could. I wanted her to be a little older. I asked myself, "How can you let her go away all summer? She's so young." But time is funny. She got older and her love for the activity didn't dwindle. In fact, it grew. At 17 she wasn't "so young" anymore and she wanted this as much as she wanted to breathe. I thought about it. I'd watched her in marching band. I'd watched her in concert season. I'd watched her march in a local all-age corps (our compromise to feed her need, give her experience and exposure to drum corps and the gift of time.) I knew she loved music, but was she ready for this? I'd heard that drum corps was hard work, but I had no idea how hard until we were in the thick of it. I realized she'd be tired, but I reasoned she'd worked hard and that she had been tired in marching season with her high school band, so she'd be fine. I had no idea how much harder this was. I fretted about her learning to take care of herself and I worried she might not be able. She was. It was Mom who wasn't quite ready to let her spread her wings that far. But, she kept growing, kept practicing, became a better and better musician, became a better and better person, and became a stronger and wiser student. I watched her deal with situations in her home life and handle them responsibly. I had to admit, she'd turned into a terrific kid and a daughter I'm darned proud to call my own. She was more than ready. 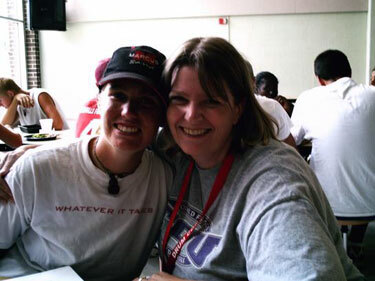 So, in late May of 2006, we drove to Houston, Texas and put her on a bus bound for the annual move-in rehearsal camp. I stood in the parking lot watching that bus pull away and I couldn't really figure out how I felt. Of course I was worried. Who wouldn't be when their child is going away for that long for the first time? But I also knew something that no one else did—I knew my child. So, I let her go. And she was so young. And it wasn't easy, but we did it. Before you ask, the answer is "yes." Yes, she called home and complained. Yes, she called home and cried. Yes, she had a night when she asked to come home. I said "no." I told her I loved her too much to let her quit. She struggled through, found a well of strength in her she didn't know she had and tapped into it. She did it and is richer for it. (And, yes, I did cry when I hung up.) Oh, and there is one more "yes." Yes, she wanted to march again this year. She knows what she's going into and is excited and we're anticipating a much smoother season this year. My daughter came home in August of 2006 and she was a much more mature child than the one I'd packed off on that bus in Houston. She had succeeded and had learned how to do it on her own. She had made choices that she was proud of and some she wasn't, and she had dealt with the consequences of both. She had become responsible for her own self and managed just fine without Mom to sort her whites from her darks and remind her to put in her retainer at night. She learned to get along with others. She learned to persevere. She learned to make the best of a bad situation and to be grateful for a good one and she'd learned to adapt and keep smiling. She learned to lean on her corps-mates and draw strength from them. All summer she kept learning and learning and while she did, as is in her nature, she strived for excellence and she also learned the meaning of a "personal best." She grew up. A few months ago, I was volunteering in the copy room at my youngest child's middle school, chatting with another band booster mom. I mentioned that my daughter would be leaving for the summer to march with DCI and she responded, "I wanted to march with drum corps when I was in high school, but my parents wouldn't let me." What a loss for her. It made me sad. My first thought was, "I'm glad my parents didn't shelter me from every situation that required me to make mature decisions or I'd have never left for college." But I also thought about it from a parent's point of view and related it to my own child. I'd been afraid to let her go on the road last year, too. This year, I was at peace with the decision. I'd watched her grow during her rookie year and I knew she could handle it. Real life situations occur in every environment, not just drum corps. We all face choices. We all have challenges. I had to go back to what I knew—I knew my daughter. I smiled and replied, "I'm sure your parents had concerns and I'm sorry you missed out on that experience. I know my Meg will face challenges on the road, too, but I know my kid. I trust my kid. I think the benefits outweigh the risks." So this kid, the one I know and love, will be getting on a plane to fly off to spring training this Sunday morning. Of course, I'll tag along at times, volunteering when I can and watching from the safe distance of the food truck, but I can't be there the whole time, nor should I be. It's her summer; her season to grow and I cannot wait to meet the woman that emerges at this season's end.